August 31, 2016  It's been a month since the Centers for Disease Control and Prevention warned pregnant women to stay away from a Miami neighborhood because of the threat of Zika. Health officials say aggressive mosquito control efforts are paying off. But business is down, and many are wondering when the travel advisory can be loosened or lifted. August 23, 2016  Business leaders worry that designating neighborhoods as hot zones will hurt tourism. State and local officials are concerned about how information is being released about Zika's spread. August 22, 2016  Mosquito repellent, long-sleeved shirts and pants are part of the plan, as well emails, texts and education about standing water. But controlling the spread of the virus is a major challenge. August 22, 2016  As school begins in the Miami area, students, teachers and parents are worried about Zika. There are several schools in the two neighborhoods where mosquitoes have been carrying the Zika virus. The school district is taking steps to protect students from the virus. August 19, 2016  Health officials in Florida are investigating an area in Miami Beach where there are two new cases of locally acquired Zika virus. In all, federal and state officials are investigating nine areas in Florida where local Zika transmission may be taking place. 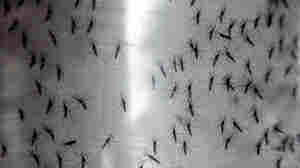 August 17, 2016  The Food and Drug Administration has approved release of genetically engineered mosquitoes in an effort to halt the spread of Zika virus. But residents of the Florida Keys aren't keen on the concept. August 16, 2016  Rep. Debbie Wasserman Schultz is fighting to keep her seat in Congress. Progressive Democrat Tim Canova has matched Wasserman Schultz in fundraising after being endorsed by Bernie Sanders. August 6, 2016  The FDA has approved field trials of a genetically engineered mosquito designed to combat Zika and other diseases. But there's strong opposition in Florida where the GMO insects would be tested. August 4, 2016  In Miami, health officials are hopeful that aggressive measures are helping to contain the first cases of locally acquired Zika. In the Miami neighborhood identified as the source of local Zika cases, businesses are thriving. August 3, 2016  The first cases of locally transmitted Zika in the continental U.S. were contracted in one of Miami's liveliest neighborhoods, Wynwood — a developing neighborhood filled with cafes, bars and art galleries. Local officials say they're heeding experts' advice to fight the virus aggressively. August 1, 2016  Mosquitoes have infected at least 10 more people with Zika in Miami, prompting the Centers for Disease Control and Prevention to recommend pregnant women avoid the area and triggering a request from the state of Florida for help from the CDC. July 30, 2016  Footvolley is a sport played like it sounds: A volleyball is kicked around like soccer with no hands. The U.S. and other countries are sending teams to Brazil, but it's not an Olympic sport yet. July 29, 2016  Health officials have confirmed that four people in South Florida appear to have contracted Zika from local mosquitoes. They're the first cases of local transmission on the U.S. mainland. July 22, 2016  Health officials think two people in Miami may have contracted the virus from local mosquitoes. 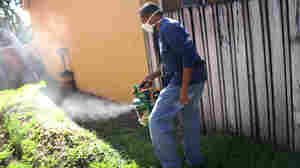 So they're spraying pesticide to help stop the virus from spreading into Florida's mosquito population.